Kurseong June 16: A major landslide occurred at 14 Mile on NH 55 near Pagalajhora in Kurseong, in the morning today. In this incident, a Darjeeling bound LPG cylinder loaded truck also met with an accident and fell around 500 ft. down in the valley. The road near 14 mile was sinking at the time when the Truck had stopped around 6 am at the spot and realizing debrises were falling underneath the road some gas cylinders were taken off the truck to lighten it but the truck along with the road collapsed 10 to 15 feet below and cracks of nearly 30 meters appeared at the site. Meanwhile the Toy Train services were also affected between NJP to Kurseong since a lot of boulders have fallen on the tracks and also cracks have appeared at several places underneath the rail tracks. Following the landslide, the direct connectivity between Siliguri to Darjeeling along the NH55 has been lost. Presently, all the Siliguri bound vehicles and Darjeeling bound vehicles have been instructed to ply via Pankhabari road and Rohini road. Mainly the landslide which occurred today has affected heavy vehicles that ply goods from Siliguri to Darjeeling. However local transport that ply tourist and local passengers have not been affected since there are other routes which is used only by light vehicles for passenger transport mainly routes via Mirik, Pankhabari and Rohini. Meanwhile concerned authorities are visiting the site of the landslide to estimate the damage and cost of repair but presently it is difficult to say when the NH55 and the Toy Train service will resume again but as per the authorities the transport services will be resumed within a week. 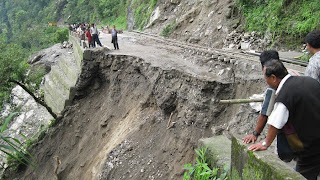 Notably, the Pagalajhora region is one place in Darjeeling Hills where such landslides occur every year during the monsoon but so far even after a decade of its maintenance the landslides have yet to stopped so far perennially. Please send me an e-mail so I can send you an official request and see how we can get a copy of the video and pay for its use within our show.